Questions for Students (and others): What is your favorite sports name change? Did you have any idea Abdul-Jabbar’s given first name was Ferdinand? 1. Cassius Clay-Muhammad Ali (Boxing). Ali in 1967. Photograph by Ira Rosenberg. Winner of the Olympic Gold Medal for Light Heavyweight Boxing in 1960, Clay was on the fast track to fame, and let everyone within earshot know it! 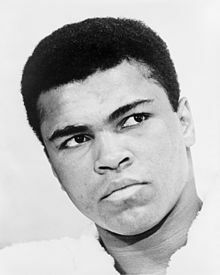 While he loudly proclaimed his “greatness,” he marched his way through 19 boxing opponents until winning the Heavyweight Championship from Sonny Liston in February of 1964. In 1966, at the age of 24, Ali was drafted into the US military, but refused induction. His refusal to serve alienated many (mostly White) boxing fans and aggravated the trend to refuse to call him by his chosen name. Eventually the snide calling of Ali as “Clay” seemed to disappear and is rarely heard now. Ali died in 2016, a quivering wreck of man apparently victimized by years of being hit in the head. He always referred to himself as “The Greatest,” and though the title is debatable, many agree with Ali. 2. 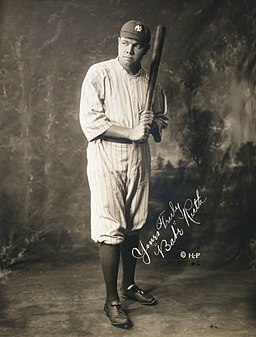 George Herman Ruth, Jr.-Babe Ruth (Baseball). Ruth in 1920. Photograph by Irwin, La Broad, & Pudlin. Not really an official name change, but “Babe” is associated with only this one great ballplayer (except for the female uber-athlete, “Babe” Didrikson Zaharias). Ruth is probably the most famous baseball player of all time and is arguably the greatest baseball player of all time. This particular author insists that Ruth is indeed the best player ever, and that means including all aspects of the game. Not only was he the greatest hitter of all time (714 major league home runs and a lifetime batting average of .342), he was also a premier left handed pitcher before switching to everyday play in the outfield, posting a won-loss record of 94-46 and an ERA of 2.28! Wow, how could anyone compete with such mastery of 2 separate aspects of baseball? He is indeed, the “Babe Ruth” of baseball! 3. Ferdinand Lewis Alcindor Jr.-Kareem Abdul-Jabbar (Basketball). Abdul-Jabbar in 2011. Photograph by Angela George. Lots of juniors on this list! Kareem was known publicly as “Lew Alcindor” as he dominated college basketball at UCLA, gaining tremendous fame and when he made his eagerly awaited debut in the National Basketball Association he was immediately compared to the “other” 7 foot superstar, Wilt Chamberlain. The 7 foot 2 inch Kareem did himself proud, notching more points than any player in NBA history, while earning 6 Most Valuable Player Awards, 6 NBA Championships and earning 19 trips to the All Star Game (another record). He also piled up more games and more minutes played than any NBA player ever and blocked more shots while grabbing more defensive rebounds than any NBA player in history. He changed his name to a Muslim name after winning his first NBA Championship in 1971 with the Milwaukee Bucks. While Kareem’s chosen form of Islam was not the controversial Nation of Islam, there was a certain amount of resentment felt by some White Americans at the name change. Too bad for those people, because Kareem has made a lifetime of social justice activism his second calling and has never hesitated to speak on behalf of civil rights and social justice. 4. 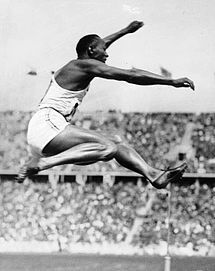 James Cleveland Owens-Jesse Owens (Track and Field). 5. Lloyd Bernard Free-World B. Free (Basketball). Free in 2015. Photograph by TastyPoutine. A flashy and prolific scoring offensive basketball player, Free played in the NBA from 1975 to 1988, during which time he was called (or called himself) “The Prince of Midair” or the more familiar “All-World.” Free claimed he earned the “All World” name as a junior high school phenom, with merely being an “All Star” or “All State” not good enough for his prodigious talents. 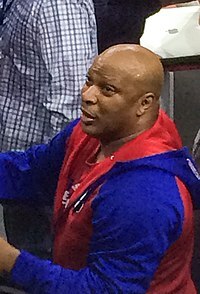 While he gave credit to his playmates for labeling him “World” (short for “All World”), it was up to him to change his name legally in 1981, at the age of 28 to World B. Free. He managed a very commendable 20.3 points per game in the NBA, but only made the All Star Team once. He was never on a NBA Championship team. Free now works in public relations for the Philadelphia 76ers. During the 1979-1980 NBA season, Free averaged 30.2 points per game, a career best. 6. Ronald William Artest Jr.-Metta World Peace (Basketball). World Peace with the Lakers in 2015. Photograph by Keith Allison from Hanover, MD, USA. 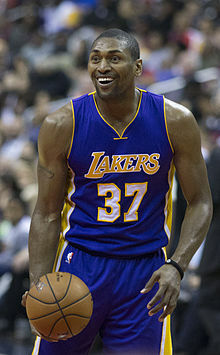 A rough and tumble basketball player, Artest was known for his defense, earning a trip to the All Star Game in 2004, the same year he won the NBA Defensive Player of the Year Award. Known for some on-court rumbles and controversies, Artest made amends in that regard by winning the J. Walter Kennedy Citizenship Award in 2011, the same year he changed his name to Metta World Peace. Now a coach with the Los Angeles Lakers player development system, Artest has also had domestic violence incidents, but those came prior to his name change. By the way, his first name is “Metta,” and his last name is “World Peace.” (Did you think his middle name was World? We did.) Artest-World Peace played in the NBA from 1999 until 2017. During the 2004-2005 season he scored 24.6 points per game, pretty good for a defensive specialist. 7. Chad Johnson-Chad Ochocinco-Chad Johnson (Football). Johnson with the Cincinnati Bengals in 2006. Photograph by Keith Allison. This outgoing personality played wide receiver in the National Football League and sought to honor Hispanic Americans during Hispanic Heritage Month in October of 2006 by changing his name to the Spanish form (sort of) of his jersey number, which was 85 (originally using “Ocho Cinco”). Chad got a bit testy when told over and over again that in Spanish “85” is NOT “Ochocinco.” Give the guy a break! He was not trying to say “eighty-five” in Spanish, but more along the lines of “eight-five” and did not want to deal with a hyphen. In any case, he got his name legally changed to “Chad Javon Ochocinco” in 2008, but in 2009 he announced he would be changing his name once again, this time to “Hachi Go” which apparently means “8-5” in Japanese. Ochocinco once again legally became Chad Johnson when he officially changed his name back to the original one in 2012. Johnson was a pretty good football player, serving 11 seasons in the NFL and another season in the Canadian Football League, racking up 766 receptions in the NFL and leading the League in receiving yards in 2006. A 6 time Pro Bowl player, Johnson caught 67 touchdown passes in his NFL career. Johnson has had some legal problems related to domestic violence and probation violations. 8. Robert Earl “Bobby” Moore-Ahmad Rashād (Football). Rashād in January 2009. Photograph by Anthony Collins. An NFL receiver from 1972 to 1982, this college running back turned receiver made it to 4 Pro Bowls and caught 44 touchdown passes in his career. The highlight of his NFL career came in 1980 while playing against the Cleveland Browns (of course) when he caught a “Hail Mary” touchdown pass from quarterback Tommy Kramer to win the game 28-23. The catch, known as “The Miracle at the Met” is one of the most celebrated in Minnesota Vikings history. The one-handed catch on the last play of the game was actually the second touchdown pass Rashād caught during the last 2 minutes of the game. After having legal (criminal) issues in college, Moore converted to Islam and changed his name to reflect his new religion, a frequent reason for famous athletes to change their name. (Remember singer Cat Stevens? Born Steven Demetre Georgiou, he has been Yusef Islam since converting to Islam in 1977.) 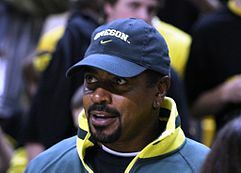 Rashād has been a highly successful television announcer since retiring from football. 9. Eldrick Tont Woods-Tiger Woods (Golf). Woods in June 2018. Photograph by Keith Allison from Hanover, MD, USA. 10. Johan Ramon Santana-Ervin Ramon Santana (Baseball). Santana with the Minnesota Twins. Photograph by Keith Allison on Flickr. 11. (Bonus) Walker Smith Jr.-Sugar Ray Robinson (Boxing). Robinson in 1947. Photograph by ACME. Did we say 10 Name Changes? Let this one count as a bonus entry. One of the greatest boxers of all time, perhaps the greatest “pound for pound” fighter ever, Robinson competed at the welterweight and middleweight levels. His name change came about when Smith needed to prove he was 18 years old (he was not) and used someone else’s birth certificate for “proof” to be allowed to compete in an AAU boxing tournament. 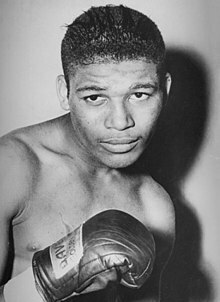 Smith was only 15 at the time, and the friend that loaned him the birth certificate was, obviously, someone named Ray Robinson. The “Sugar” addition came later, because Ray’s boxing was so “sweet.” Or because a female boxing fan said Ray was “sweet as sugar.” (Note: Boxing is called “The Sweet Science.” Why, we do not know.) Robinson compiled a massive record of 173 wins and 19 losses among his 200 professional fights. Like many professional fighters, Robinson lost his money and was broke upon retirement, dying in 1989 at the age of 67, suffering from a variety of ailments including Alzheimer’s Disease. Meltzer, Milton. A book about names: In which custom, tradition, law, myth, history, folklore, foolery, legend, fashion, nonsense, symbol, taboo help explain how we got our names and what they mean. Crowell, 1984. Vincent, Woody. What’s In A Name: The stories behind some of the best known companies, products and names in the world. CreateSpace, 2012. Zirin, Dave. What’s My Name, Fool? Sports and Resistance in the United States. Haymarket Books, 2005. The featured image in this article, a photograph of Muhammad Ali from 1966 from the Dutch National Archives, The Hague, Fotocollectie Algemeen Nederlands Persbureau (ANEFO), 1945-1989 bekijk toegang 2.24.01.04 Bestanddeelnummer 924-3060, is licensed under the Creative Commons Attribution-Share Alike 3.0 Netherlands license.